General Martin Dempsey on what he learned from the writings of W.B. Yeats. I first became interested in the poetry of William Butler Yeats in graduate school. By that time I had accumulated enough life experience to help make sense of this prolific poet who wrote of folklore, history, romance, heroism, and mysticism in the years between his first published book of verse in 1889 and his death in 1939. It resonated then with my own experiences as a young officer dealing with race issues in the military, and it resonated with me again later as a much older officer trying to assist and encourage Iraq’s various ethnic and religious groups to rebuild their country. “We can make our minds so like still water that beings gather about us that they may see, it may be, their own images, and so live for a moment with a clearer, perhaps even with a fiercer life because of our quiet” (“Earth, Fire and Water,” in The Celtic Twilight, 1893). In 1893, Yeats felt the need to remind himself and others that the way to find clarity and depth in life is to slow down and take the time to reflect. In 2017, I find this message even more compelling. Moreover, this passage speaks to me about the kind of leadership most needed in this Era of Digital Echoes: Leadership that lowers the volume of self-absorption and divisiveness. Leadership that clarifies. Leadership that encourages self-awareness and openness. The kind of leadership that builds trust. Quiet, confident, reflective, encouraging, empowering, sense-making leadership. Martin “Marty” Dempsey was aUnited States Army general who served as the 18th Chairman of the Joint Chiefs of Staff from October 1, 2011 until September 25, 2015. After 41 years in service, General Dempsey retired as the nation’s highest-ranking military officer. He now lives in North Carolina where he is faculty at Duke University, sits on two nonprofit boards, plays a leadership role in the NBA, serves as chairman of USA Basketball, and develops leaders with Starfish Leadership. 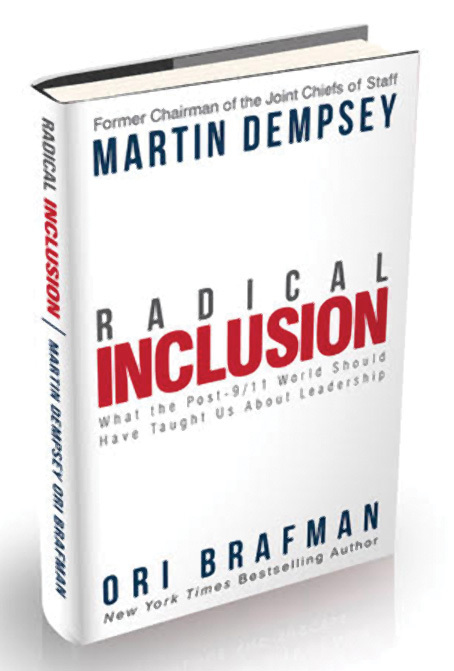 General Dempsey, who also has a master’s degree in literature from Duke where he wrote his thesis on the Irish literary revival, is the co-author of Radical Inclusion: What the Post-9/11 World Should Have Taught Us About Leadership (Missionday) with New York Times bestselling author Ori Brafman. The book is set for release on March 6, 2018. General Dempsey was inducted into the Irish America Hall of Fame in 2015.